Russia has set up a government commission to deal with the problems faced by Russians living abroad. Its main task will be to help integrate Russian nationals into their host countries, Russian Foreign Minister Sergey Lavrov said during a business lunch at the editorial office of Rossiyskaya Gazeta. Russia formulated the new tasks at the last Congress, with the support of expat organizations abroad, said Russian Foreign Minister Sergey Lavrov during a business lunch at the editorial office of Rossiyskaya Gazeta. "It was agreed that the paternalistic model be done away with, as it was largely confined to humanitarian aid, money transfers and relief aid," he added. "The new model is intended to help integrate Russians into their new society; we are here to protect their rights and provide the necessary conditions for them to become respected citizens in their new country." The overwhelming majority of Russians living abroad want to stay where they are, but they want to live as equal citizens of the host state, Lavrov said. "This is where we come in," he said. "So far, we have observed a degree of discrimination, not only in Latvia and Estonia, but also in a number of European countries, where Russian nationals have difficulties exercising their social, economic and humanitarian rights. Education in the Russian language is a prime example." This has become the key theme in the work of the government commission dealing with the affairs of Russian citizens living abroad. "Humanitarian aid, of course, remains," Lavrov argues. "But the main effort will go into helping expat organizations unite and secure a worthy role in the life of the host state. One of the ways in which we are helping them achieve this goal is by providing assistance to Russian-language publications." The Russian School Abroad project has been set up and is about to receive funding. The target is, as a first step, to have at least one school that teaches the Russian curriculum in every CIS country. 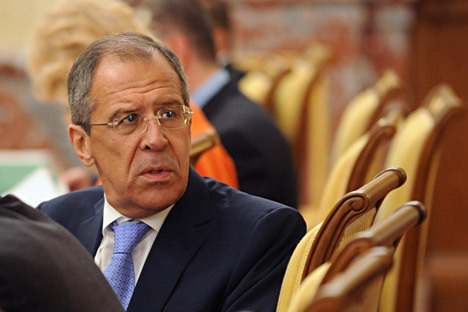 "One school is not enough, of course – we would like more," Lavrov said. "As funds become available, we will expand the project. We do not want the program to be confined to the CIS alone; we want it to be implemented in other countries where there is a large Russian community." As for bringing back human capital and intellectual potential, this is not exactly within the domain of our commission. "I do not think anything can be achieved by issuing directives," Lavrov said. "These people will start returning when they feel that the opportunity to be productive and profitable in Russia is there. This is a challenge for the whole government. The cabinet and the country’s leadership are aware of it. This much is clear from the President’s directive, which presses the need to provide the best possible conditions for doing business. The important thing is to fulfill them all." The full interview was first published in Russian in Rossiyskaya Gazeta.